Just another website for fly fishermans. 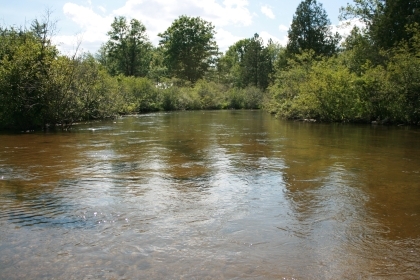 The Ludington Daily News has learned that what appears to be a new world record brown trout was caught in the Manistee River this morning. Grand Rapids area resident Tom Healy caught the 41-pound, 7.25 ounce monster on a crankbait while fishing with Tim Roller’s charter service. Michigan DNR fisheries biologists Mark Tonello and Todd Kalish weighed the fish after leveling the certified scales and determined the weight. It is the new record hold for Michigan. Upon the second weighing with the scales leveled, the weight was determined to be 1 pound, .75 ounces heavier than originally determined. The fish was 43.75 inches long. The fish is 1 pound, 3.25 ounces heavier than the reigning world record German brown trout, a 40-pound, 4-ounce fish caught in Arkansas in 1992 by Howard “Rip” Collins who used an ultralight rod and 4-pound test line to catch that fish. Healy will have to apply for certification to be declared the world record holder.